Another addition to the Air Jordan 13 (XIII) Retro line, but this is one of the first Retro Lows to release. 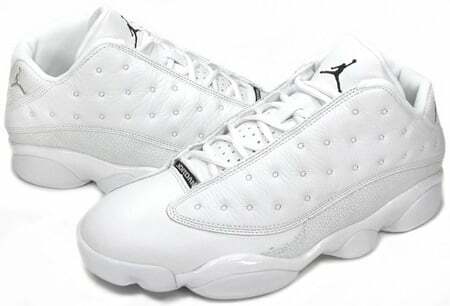 This model is the Air Jordan 13 (XIII) Retro Low White / Metallic Silver – Midnight Navy – Ice Blue. A great summer shoe, the Air Jordan 13 (XIII) Retro Low White / Metallic Silver – Midnight Navy – Ice Blue retailed for $130, and released April 23rd 2005. The small accents of Ice Blue and Navy brought life to this Air Jordan 13 Retro Low.